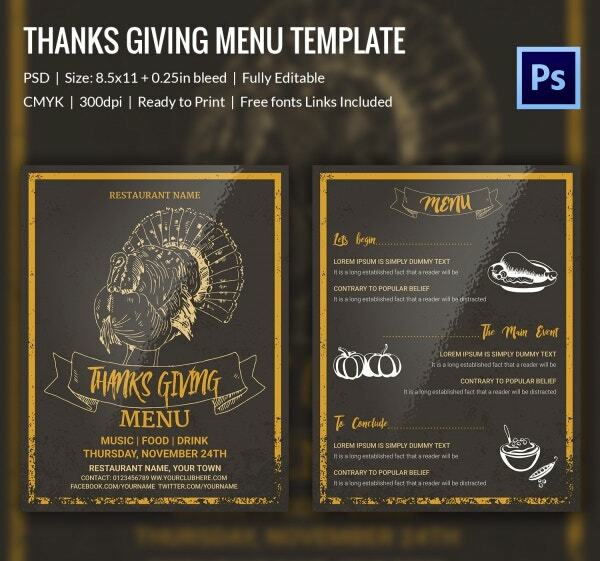 25+ Thanksgiving Menu Templates – Free Sample, Example Format Download! In America, Thanksgiving is one of the most important days of the year. You get together with your friends and family members to celebrate this special day, either with a home cooked meal or by eating out. 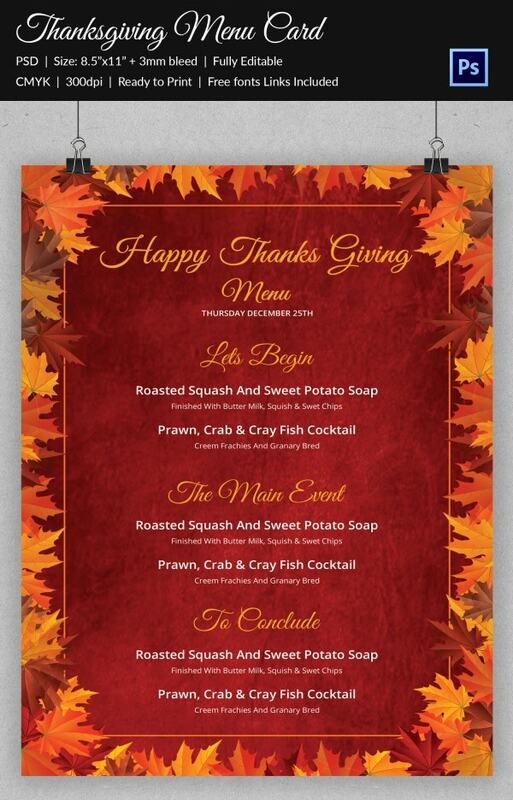 Most restaurants usually have a special Thanksgiving menu just for this one day, complete with a special menu. Menu templates could help you out here! 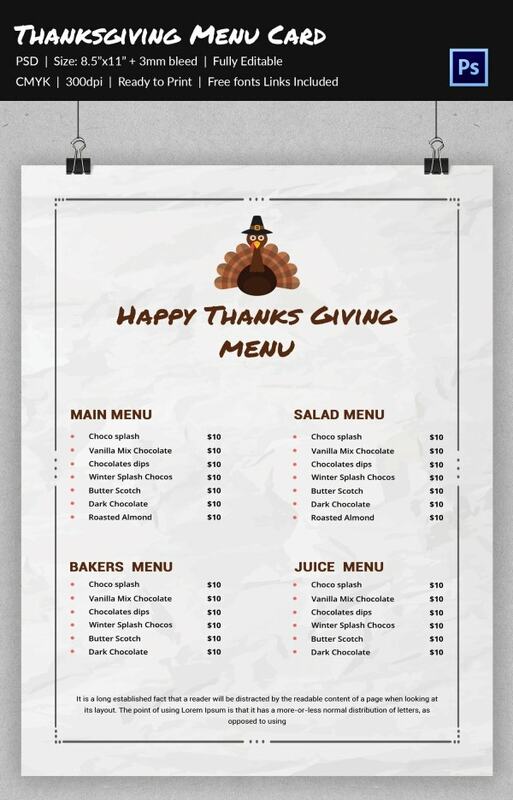 This thanksgiving menu template comes with a black background against which the stylish text stands out. Also, this template comes with a CMYK color mode and a print ready format. 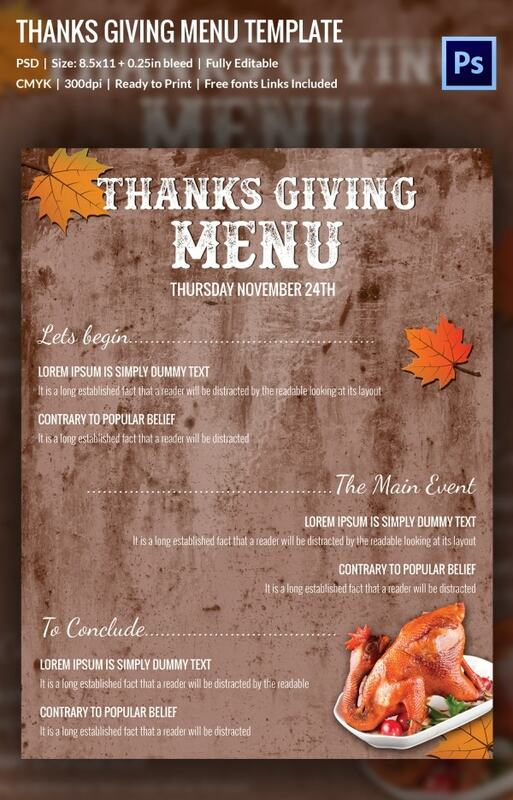 This thanksgiving menu template here comes with a fall theme. When you think of fall, you instantly think of thanksgiving. Plus, this template comes with easy customization options as well. 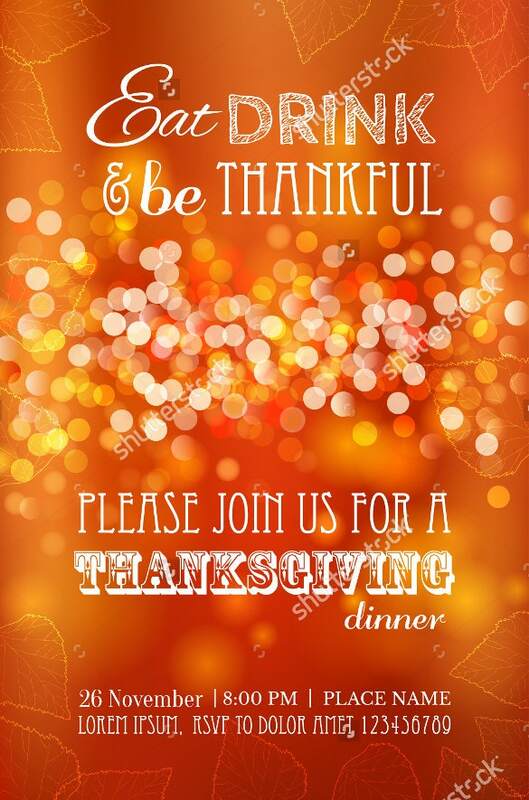 A thanksgiving menu template sample would be perfect if you were to organize a party at your place for a large number of people. You could add a personal touch to the menu and customize it just the way you please. It would certainly add to the charm of your dinner party. You can also see Free Menu Templates. 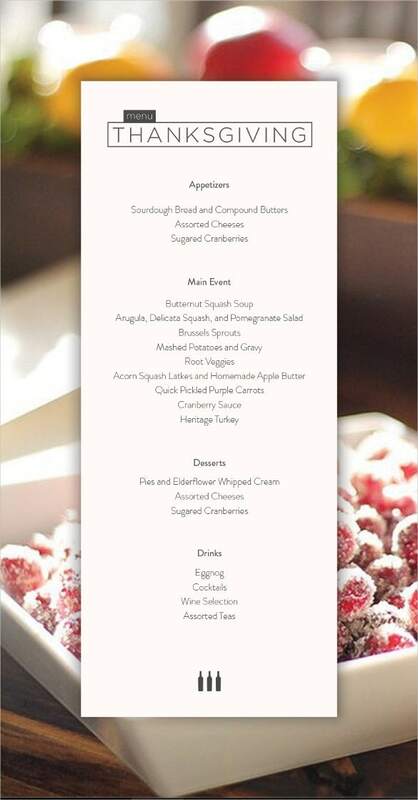 When planning for dinner party for family and friends for the Thanksgiving Day celebrations, this sample menu can help. It has a simple design that can be customized as you desire. 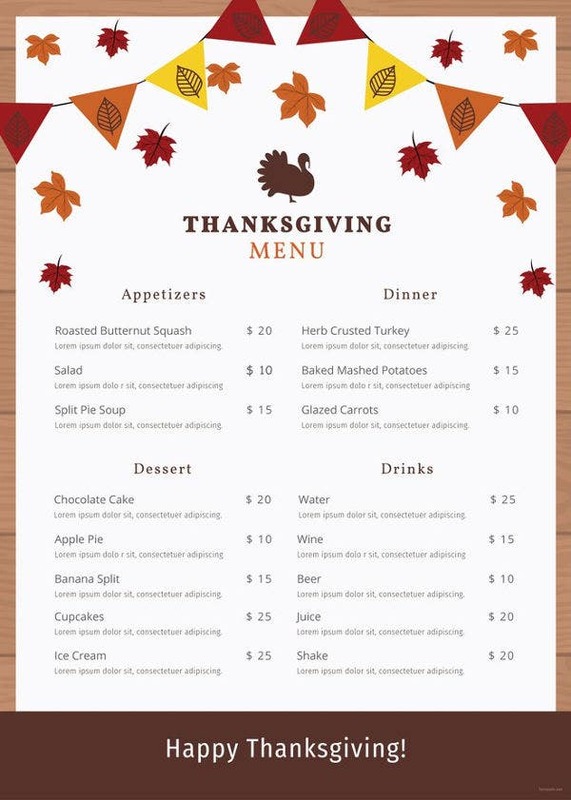 In order to make a simple and informative Thanksgiving Day dinner menu, this example can help you along. This is designed in an easy to modify layout allowing you to insert your text based on what you have cooked. 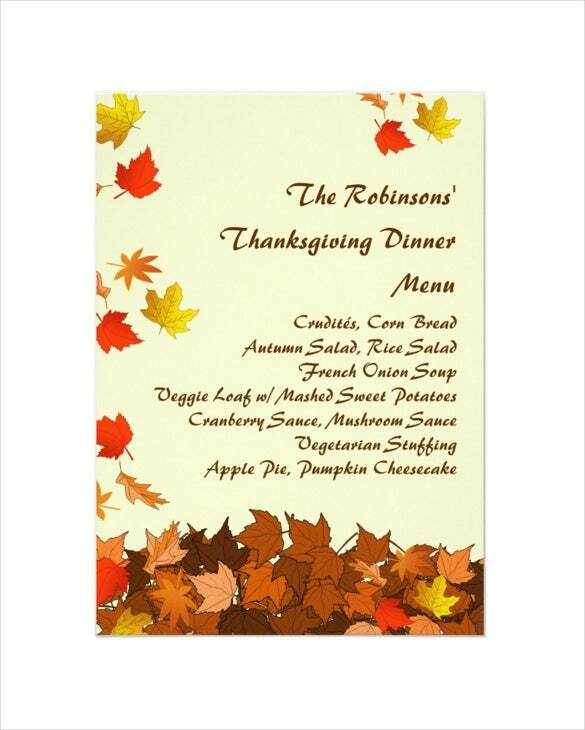 Anyone can use this printable thanksgiving menu card example. It is available for free download and can be printed on your choice of paper to make that simple yet lovely menu. 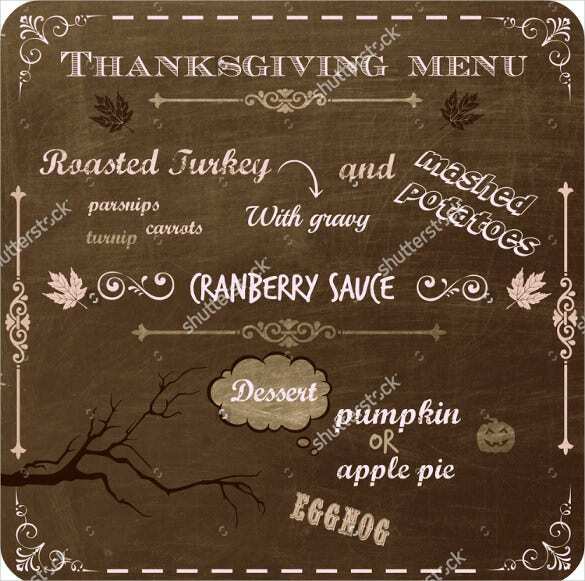 In order to create a great Thanksgiving Day dinner menu our sample template is what you need. It is simple in design and is available on a white background and can be downloaded from this site. There is no better way to plan a get together for thanksgiving as a family other than cooking the meal together. This sample menu shows what is available for dinner and who has cooked it among the family members. Make your thanksgiving dinner party more enjoyable by creating this kind of menu. The sample shows how flowery the menu will look and it allows you to include the available side dishes, main dishes and others. 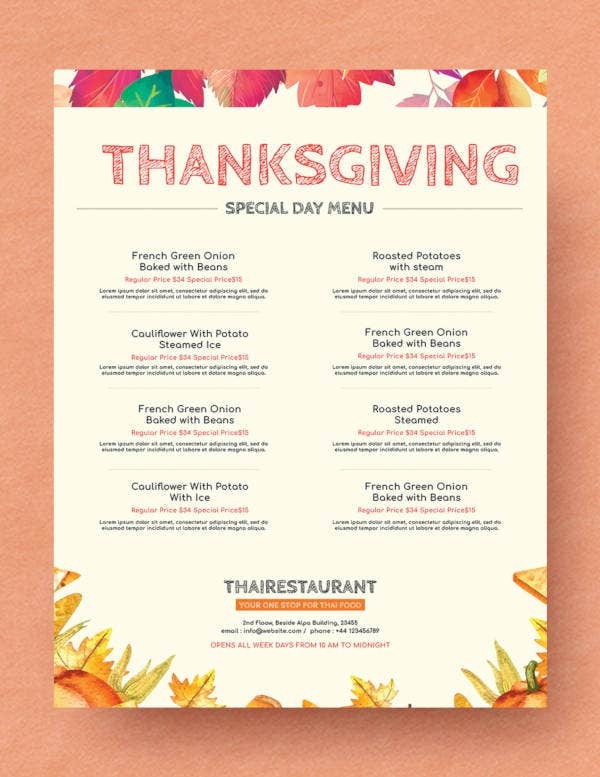 This example template can help you create great menu for the Thanksgiving Day dinner. The templates are printable and are available for free download. They are made in six different designs for your choice. 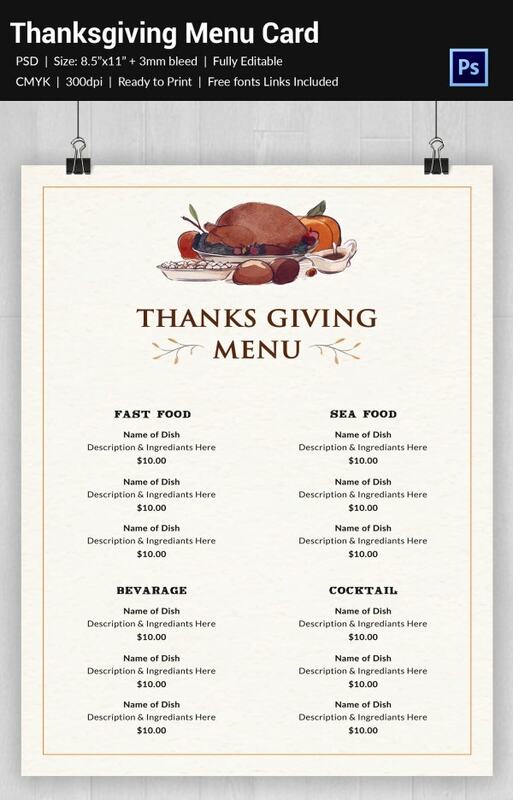 In order to make thanksgiving dinner wonderful start by making the menu attractive. 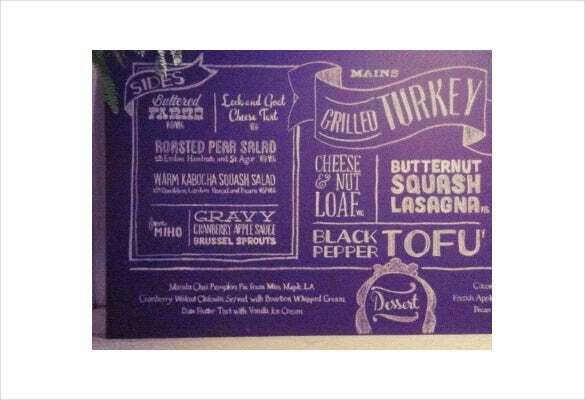 This vintage chalkboard design brings back memories of ages past. The sample is available for free download from our site. 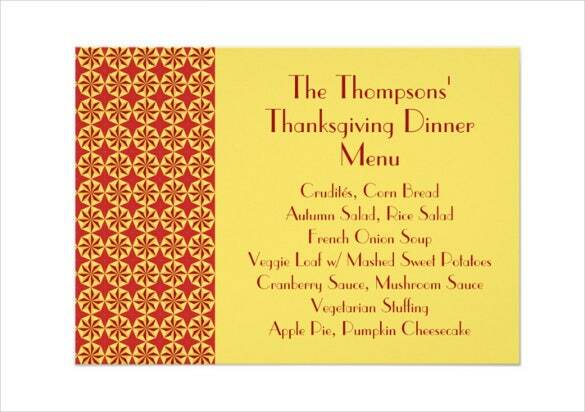 If you want to make Thanksgiving Day dinner celebrations tantalizing, begin with the menu. 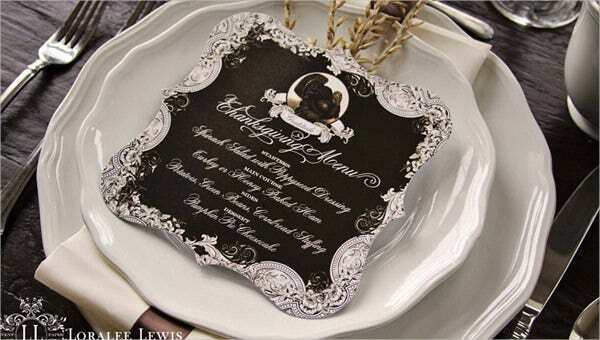 Use our sample menu template with autumn leaves to create your lovely menu. It is available in art format. 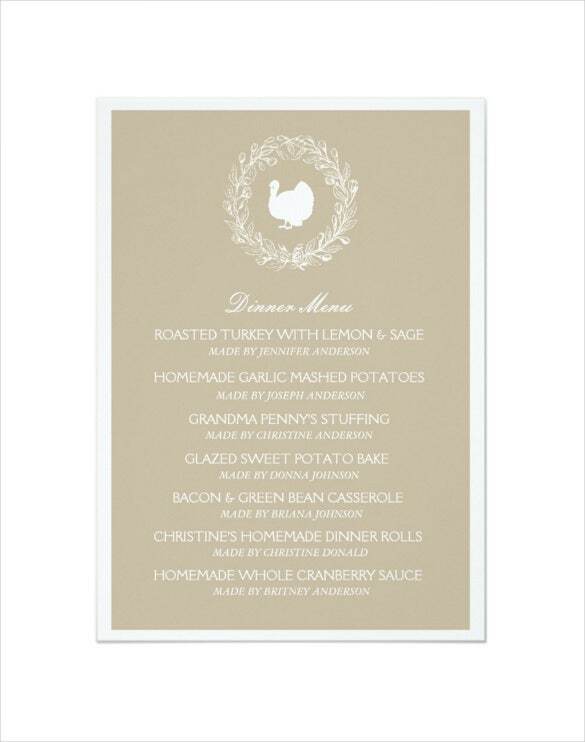 Create your impressive thanksgiving dinner menu with this artistically created menu template. The example here has falling leaves in a beautiful design with bold font lettering. Download it today free of charge.